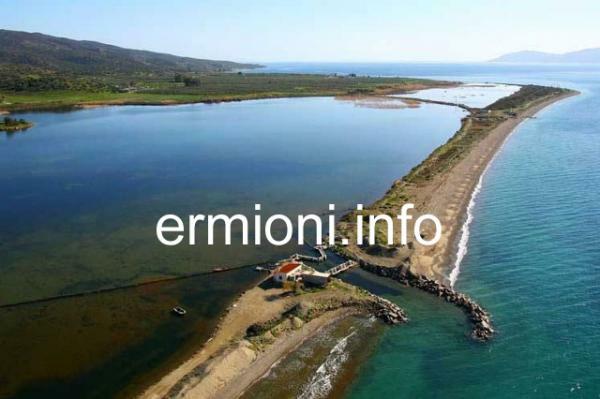 Thermisia is a village located on the main coastal road East of Ermioni. Close to Thermisia there is Lizard Rock which has a Frankish Crusader castle on its summit, also Porto Hydra Village, which in the past has been referred to as the 'Venice of Greece'. Thermisia itself is a sleepy little village during the daytime, with a village church, some shops, a supermarket and a cafe/ouzeria where the locals can be seen having a drink and discussion. However, in the evenings there are a couple of interesting tavernas that are worth a visit, within the village as well as on the outskirts, next to the sea. Along the coastline, either side of Thermisia, you have a choice of quality hotels, a private and time-share village home complex, a beachside Inn and a popular camping site that offers something for every taste and budget. Castle of Thermisia is located close to the village of Thermisia, on Lizard Rock. 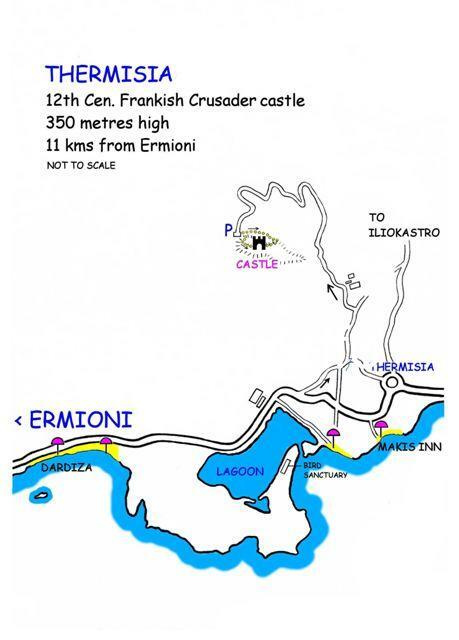 The Frankish Crusaders built this hill-top castle in the late 12th Century, which acted as a lookout post for potential coastal raids on Kastri (Ermioni) and also defended valuable salt-pans that were located in the lagoon area below. The castle was first mentioned in written sources in 1347, as being called Tremis, although it was also known as the Castle of Oria. The castle experienced numerous invaders throughout its history with Franks, Byzantines, Ottomans and Venetians occupying this castle throughout the whole Middle Ages. Although the Ottoman Turks captured the Imperial City of Constantinople in 1453, the Venetians continued to occupy this hill-top castle for a further 84 years. 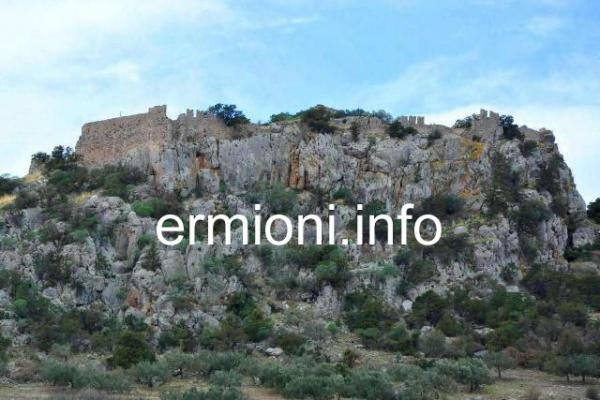 The Castle of Thermisia was finally surrendered to the Ottoman Kasim Pasha in 1537, the same year that the Kastri (Ermioni) fortress was captured. In 1689 the Venetians regained control of the castle from the Ottomans, finally destroying the hill-top castle when they left in 1715, never to return. 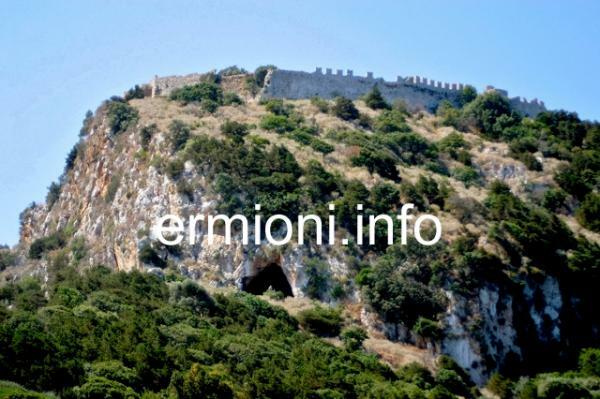 The ruins of this coastal castle can be visited today, with a moderate 350 metre climb. The castle is located on two peaks of Lizard Rock, no one is really sure how it was connected. Although there are some steps that can be seen below, it is believed that there used to be a pulley system or rope suspension bridge between the two peaks. However, it leaves todays explorers a difficult task in reaching one peak from the other. From the war monument at one end of Thermisia (pictured top left) a 2 kms drive will get you to the open-air car park at the rock base. From there you can follow the faded red direction arrows to the summit. Access to the castle ruins can be climbed with caution, particularly if the ground is wet. Today, Lizard Rock is also a popular destination for experienced rock climbers, as well as paragliding enthusiasts. The present lagoon at the base of Lizard Rock used to contain salt pans throughout the whole period of the Middle Ages. With salt being a very rare and valuable commodity then, the area was defended by the armed garrison stationed at the overlooking castle of Thermisia. Today, the deserted sanctuary building that is situated at the far end of the lagoon is used by cormorants, migratory birds setting off on their annual flight to and from Africa. Along the coastline, close to the lagoon, you'll find the popular 'Hydra's Wave' camping site and a little further East, towards Thermisia, there is the beachfront 'Makis Inn' that offers quality restaurant and bar facilities, in addition to a clean sandy beach. Barceló 'Hydra Beach' 5-star hotel and apartment complex is a 1 km coastal drive East of Thermisia village. The 'Hydra Beach' complex has been recently renovated and is operated as an all-inclusive holiday destination, very popular with Italian and Spanish tourists. Non-resident guests can use the hotel bars, restaurants, spa centre, pool, gym and sports facilities at any time, at a price. Porto Hydra Village is a large coastal residential area that is located 2 kms East of Thermisia. 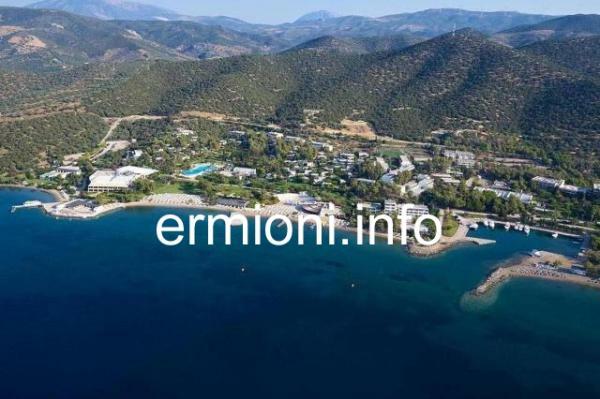 The Village has private and time-share properties built around a canal network giving access to the sea and the Argo-Saronic islands of Hydra, Poros and Spetses. Porto Hydra Village was founded and developed in the early 1990's and enjoyed unrivelled popularity with the Greek and International 'jet-set' of the time. It was THE place for film stars, performers, politicians and sports stars to stay and be seen in Greece. The Village was able to offer private and secluded waterside accomodation, total security, luxury hotel facilities, top cuisine and fine dining, quality live music performers, private motor-boat mooring, assorted games facilities, water sports and a long clean sandy beach. Located on the mainland, opposite the picturesque island of Hydra, it has often been described as the 'Venice of Greece'. Today, Porto Hydra Village consists of over 300 private villas and holiday homes which are used throughout the year, each having their own private car-parking area. The spectacular canals, created around artificial islands, are surrounded with beautiful gardens and walkways that lead residents and their guests down to the wonderful clean sandy beach. Porto Hydra has been designed to offer spacious waterfront villas as well as smaller holiday homes and cottages, so there is something for everyone. 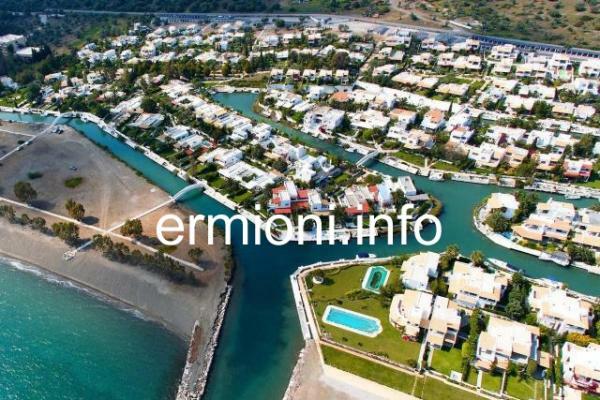 The properties that are located around the canal system have private boat-mooring space in addition to designated beach and car-parking spaces.